The crankshaft position sensor measures the rotation speed (RPMs) and the precise position of the engine crankshaft. Without a crankshaft position sensor the engine wouldn't start. 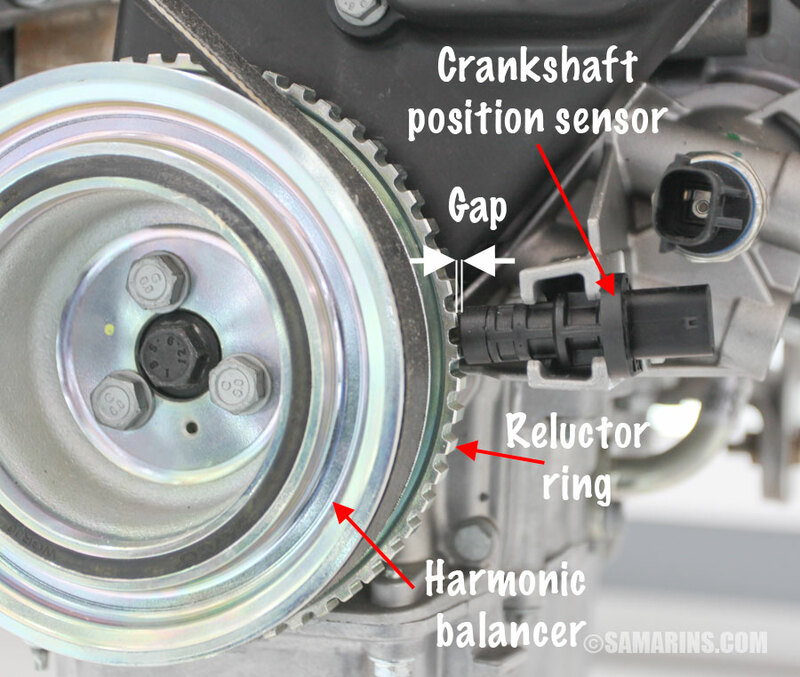 In some cars, the sensor is installed close to the main pulley (harmonic balancer) like in this Ford in the photo. In other cars, the sensor could be installed at the transmission bell housing, or in the engine cylinder block, as in the photo below. In the technical literature, the crankshaft position sensor is abbreviated to CKP. The crankshaft position sensor is positioned so that teeth on the reluctor ring attached to the crankshaft pass close to the sensor tip. The reluctor ring has one or more teeth missing to provide the engine computer (PCM) with the reference point to the crankshaft position. As the crankshaft rotates, the sensor produces a pulsed voltage signal, where each pulse corresponds to the tooth on the reluctor ring. The photo below shows the actual signal from the crankshaft position sensor with the engine idling. In this vehicle, the reluctor ring is made with two missing teeth, as you can notice on the graph. 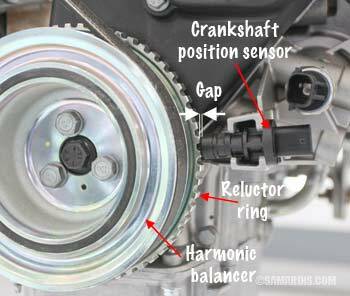 The PCM uses the signal from the crankshaft position sensor to determine at what time to produce the spark and in which cylinder. The signal from the crankshaft position is also used to monitor if any of the cylinders misfires. Crankshaft position sensor signal on the oscilloscope screen. If the signal from the sensor is missing, there will be no spark and fuel injectors won't operate. The two most common types are the magnetic sensors with a pick-up coil that produce A/C voltage and the Hall-effect sensors that produce a digital square wave signal as in the photo above. Modern cars use the Hall-effect sensors. A pick-up coil type sensor has a two-pin connector. The Hall-effect sensor has a three-pin connector (reference voltage, ground and signal). A failing sensor can cause intermittent problems: a car may cut out or stall randomly, but then restart with no problems. The engine might have troubles starting in wet weather, but starts OK after. Sometimes you might see the RPM gauge behaving erratically. In some cases, a failing sensor can cause long crank time before the engine starts. If the sensor is bad, the engine will crank but won't start. 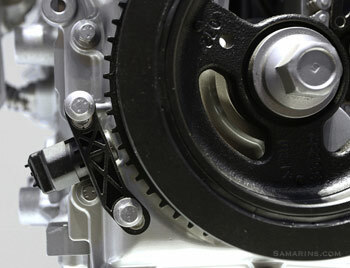 Read more: Why an engine cranks but won't start: common problems. The most common OBDII code related to the crankshaft position sensor is P0335 - Crankshaft Position Sensor "A" Circuit. In some cars (e.g. Mercedes-Benz, Nissan, Chevy, Hyundai, Kia) this code is often caused by a failed sensor itself, although there could be other reasons, such as wiring or connector issues, damaged reluctor ring, etc. In some cars, the intermittent stalling can also be caused by a problem with the crankshaft position sensor wiring. For example, if if the sensor wires are not secured properly, they could rub against some metal part and short out, which can cause intermittent stalling. The Chrysler bulletin 09-004-07 describes a problem with some 2005-2007 Jeep and Chrysler models where a failed crankshaft position sensor can cause a no-start problem. The sensor will need to be replaced with an updated part to correct the problem. Another Chrysler bulletin 18-024-10 for some 2008-2010 Chrysler, Dodge and Jeep vehicles mentions a problem where the code P0339 - Crankshaft Position Sensor Intermittent can be caused by improper gap or a bad flexplate. Failures of the crankshaft position sensor were common in some 90's GM cars. One of the symptoms was stalling when the engine is hot. Replacing the crankshaft position sensor usually solved the problem. Whenever there is a suspicion that the problem might be caused by a crankshaft position sensor or if there is a related trouble code, the sensor must be visually inspected for cracks, loose or corroded connector pins or other obvious damage. The proper gap between the tip of the sensor and the reluctor ring is also very important. The correct testing procedure can be found in the service manual. We posted several links where you can access a service manual for a subscription fee at the bottom of this article. For the pick-up coil type sensors, the testing procedure includes checking the resistance. For example, for the 2008 Ford Escape, the resistance of the crankshaft position sensor (CKP) should be between 250-1,000 ohms, according to Autozone. 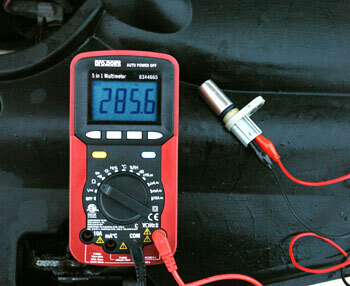 We measured 285.6 ohms (in the photo) which is within specifications. If the resistance is lower or higher than specified, the sensor must be replaced. For the Hall-type sensors, the reference voltage (typically +5V) and the ground signal must be tested. The most accurate way to test a crankshaft position sensor is checking the sensor signal with an oscilloscope. Sometimes, the sensor may have an intermittent fault that is not present during testing. In this case checking for Technical Service Bulletins (TSBs) and researching common problems may help. 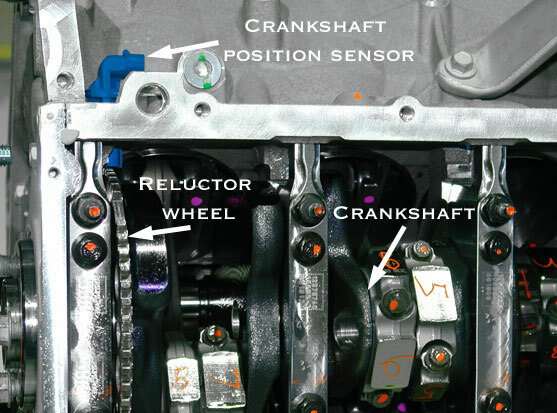 The crankshaft position sensor can be checked with a scan tool. It shows the sensor signal as "Engine RPM" or "Engine speed." When this could be helpful? If a car stalls intermittently, monitoring the sensor signal can provide the answer: if the sensor signal suddenly drops to zero, and then comes back it means either there is a problem inside the sensor or with the sensor wiring or connector. If the sensor works properly, the RPM signal should drop or rise gradually. as in this photo. 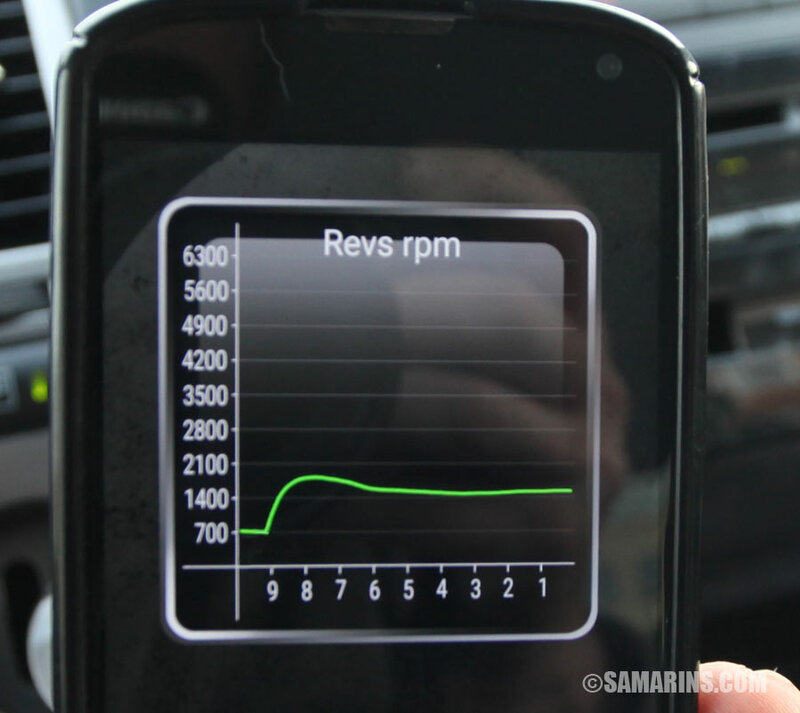 We have tested the crankshaft position sensor in this car with an OBDII "Torque" app on the mobile phone. Replacing a crankshaft position sensor is not very expensive. The part costs from $35 to $115 plus $55-$130 for the labor. It's best to use an OEM part. In most cars it's fairly easy to replace, although sometimes the sensor could be difficult to remove due to corrosion. See these Youtube videos for more info. When replacing a crankshaft position sensor, it's important to verify the proper gap between the sensor and the reluctor ring teeth.